Yikes. Turns out, after a bit of research, what I thought was a fox we saw twice on our walk yesterday, was most definitely a coyote. The good news is, I’m sure that is what Mr. Suburban thought was a wolf, too! Needless to say, I did not venture outside for any form of exercise today! In fact, there was no exercise today at all. Unless chasing the granddaughters around and making 100 trips to the basement for laundry counts?? 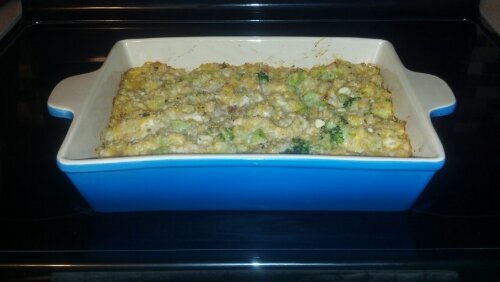 I did, however, manage to whip up a tasty chicken-broccoli-quinoa casserole for dinner! This was my first go round with quinoa, and I loved it! Benny is in a food coma from all the goldfish crackers, cereal, marshmallows, etc….he loves when the granddaughters sleep over! Tomorrow will begin with this…..ugh. Casseroles, love them or hate them? Casseroles-Love! But it’s way to much food for me to make just for myself since my fiance doesn’t eat them! Jillian Michaels- Undecided. I have a DVD that has her showing how to use equipment and it’s pretty boring but on the biggest loser she’s awesome. Run safely with the coyotes! I know how you feel about the too much food thing, as the hubby and son aren’t always fans of my casseroles! Luckily,my in laws live across the street, and they always love my cooking! mr. kane will have to attempt this one. i love quinoa! he made a delicious chili last night – i will have him share his recipe. Sounds good! I will definitely be trying that one out.